1 of 4 In a medium-size bowl, whisk lemon juice, vinegar, dill, basil, honey, mustard, 3/4 teaspoon of the salt and the pepper until well blended. In a slow stream, whisk in oil until blended. 2 of 4 Place chicken in a large resealable bag. Add 1/3 cup of the dressing and half of the lemon slices. Seal bag; refrigerate 2 hours to marinate, turning at least once. Reserve remaining dressing, stirring in remaining lemon slices and olives. 3 of 4 Heat gas grill to medium-high or prepare charcoal grill with medium-hot coals. Remove chicken from marinade; discard marinade. 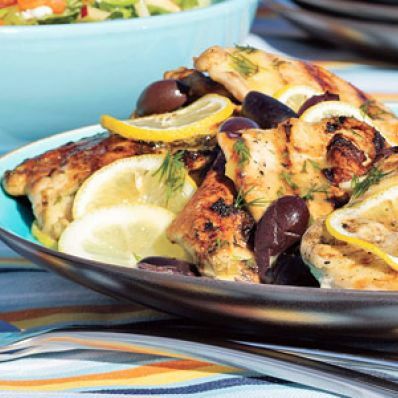 Grill chicken 5 to 6 minutes per side, turning once, until chicken registers 160 degrees F on an instant-read thermometer. Remove to a portable container. 4 of 4 Pour reserved dressing over chicken; season with the remaining 1/4 teaspoon salt. If grilled ahead, let come to room temperature before serving (about an hour).